What could you do with $1.7 billion in a city of around 200,000, where 33 percent of households live below the federal poverty line? The city of Rochester, with Mayor Lovely Warren at the helm and supported by partners and allies across New York State and beyond, has hatched a plan to tap into at least that much to help level the economic playing field for Rochester’s most disadvantaged neighborhoods. “It’s about being able to give employees an opportunity to have ownership and to build wealth within their own communities,” says Warren. The plan consists of supporting the creation or growth of cooperatively owned businesses located primarily in the city’s most distressed neighborhoods, collectively known as the Northern Crescent. “We liked the ability to improve neighborhoods by actively having employees build co-ops in a neighborhood that’s challenged, where people could actually walk to and from work, building wealth and keeping the money in the neighborhood,” Warren adds. The plan was inspired by and modeled directly after Cleveland’s Evergreen Cooperatives. The $1.7 billion comes from Rochester’s universities, hospitals and other local anchor institutions, which collectively spend that amount on procuring goods and services. That represents a ready-made market for co-ops, according to the plan’s feasibility study. The city announced the beginning of the implementation phase of the plan in March. Cleveland-based Democracy Collaborative (which conducted the feasibility study and created the Evergreen model) will oversee and coordinate implementation for Rochester. Rochester has suffered greatly from the loss of jobs tied to former industrial giants Xerox, Eastman Kodak, and Bausch and Lomb. These three companies employed around 62,000 people directly in the 1980s (60 percent of the local workforce), with those employees providing a steady market base for many other local businesses. By 2012, the three employed just 6 percent of the Rochester metro workforce. In the Northern Crescent neighborhoods, median income is less than half that of the Rochester metropolitan area. More than 60 percent of residents live below the poverty line. The neighborhoods are also the principal destinations for men and women returning from prison, according to the feasibility study. In one neighborhood, known as 14621 (after its ZIP code), about a quarter of men between the ages of 20 and 49 are either on parole, probation, incarcerated or otherwise under the supervision of the criminal justice system. 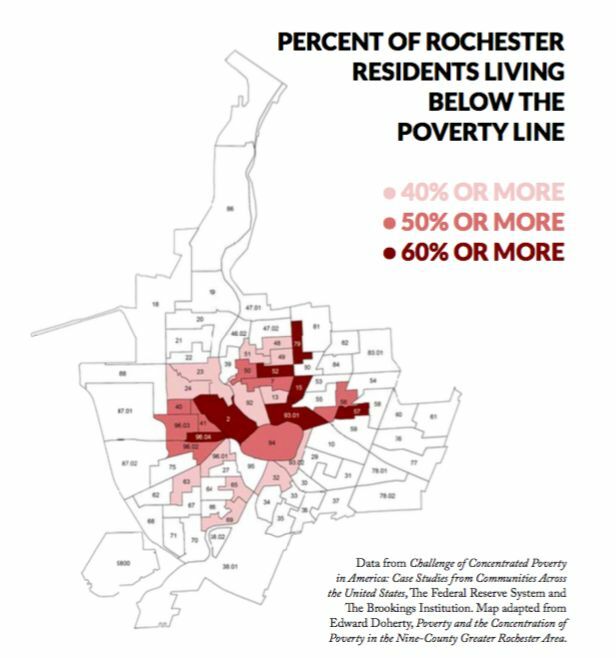 The Northern Crescent area is already a main focus of the Rochester-Monroe Anti-Poverty Initiative (RMAPI), an effort convened by United Way of Greater Rochester and led by city, county and state officials to coordinate public and private resources to address the Rochester metro’s concentrated poverty in terms of affordable and quality education, healthcare, childcare and other social supports. Rochester’s co-op plan, known as the Market Driven Community Cooperatives Initiative, is meant to complement RMAPI. “We’re saying to the neighborhoods, if we do this, if we remove as many institutional barriers as we can, will you take this stairway out of poverty we’ve also invested in,” Warren says. The plan outlines numerous workforce development programs, re-entry programs and other key support actors already in place in the targeted neighborhoods. The implementation schedule calls for the creation of a community-owned, cooperative business development corporation, to be known as the Market Driven Community Cooperatives Corporation (MDCCC). It will be set up as a 501(c)(3), and will begin its life under the auspices of Rochester’s Department of Neighborhood and Business Development. MDCCC will serve as a holding company to get the cooperatives up and running, formalize partnerships with anchor institutions, provide technical assistance to cooperatives, and seek investors and funding partners for a revolving loan fund to serve as a source of capital for new and existing cooperatives or existing businesses interested in converting into worker co-ops. The plan points to several local partners that could serve as investors or hosts of the revolving loan fund, such as Genesee Co-op Federal Credit Union and PathStone Enterprise Center. Similar to Cleveland’s Evergreen Cooperatives, Rochester’s MDCCC will eventually fund its work out of profit-sharing agreements with the cooperatives it helps to form. Until that time, it will have to raise funds on its own from public and private sources. Warren floated the idea of funding MDCCC through a social impact bond arrangement: If the MDCCC could show that it saved the city money by reducing the number of individuals receiving taxpayer-funded social services, as a result of moving up the economic ladder through worker-ownership, that could represent huge long-term taxpayer savings, justifying repayment of a hypothetical social impact bond.